Pullman Khao Lak welcomed wedding planners from Phuket and India to showcase Khao Lak as the new wedding destination in Thailand. Partnering with Oriental Events and TAT Mumbai, the resort invited 40 planners on a hosted famil to showcase this resort and its unique venues. Five venues were set up to showcase different styles of events that the resort can cater for ; right from a chapel wedding to a beach front Indian wedding, the guests got to experience how these venues look when dressed up. 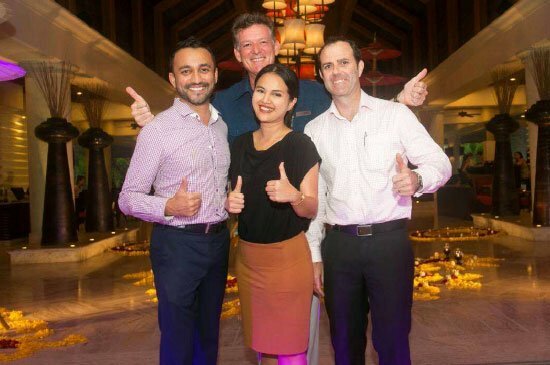 The management at Pullman Khao Lak Katiliya Resort and Villas, Mr.Jerome Stubert, General Manger(certer) , Mr.Matt Fynch, Director of Sale and Marketing(right), Mr. Sidd Ketkar, Director of Sale(left) and Ms. Sujittra Rongmuang, Sales Event Manager(second right) extended a warm welcome to TAT Mumbai and Wedding Planners from Phuket during their visit to Pullman Khao Lak Katiliya Resort and Villas. A perfect wedding location for lasting memories,Pullman Khao Lak Katiliya Resort and Villas offers a wide selection of indoor and out-door venues. Our Sukhaothai Pound, Beachfront, Bell Tower, Ballroom, Chapel are some of the venues you can choose for your special day. From an intimate event to a large celebration, our function space can be tailored to cater for the wedding of your dreams. For more information about the hotel or to book a table at one of the restaurants, please contact sm1@pullmankhaolak.com or call +66 76 427 530.